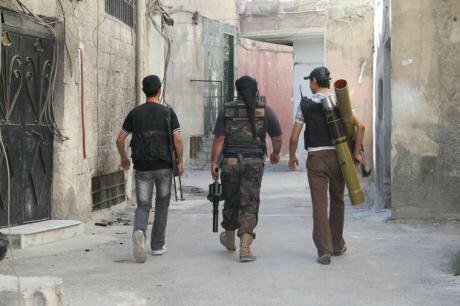 Free Syrian Army fighters carry their weapons to the frontline in Damascus. Demotix/Majid Almustafa. All rights reserved.The deadly attacks in Madrid (2004), London (2005), Glasgow (2007) and Stockholm (2010), followed by the foiled attempts and arrests in Copenhagen (2010) and Berlin (2011) have together moved the issue of violent extremism and ‘radicalisation’ back onto political agendas at the European Union and across its member states. Fear of ‘radicalisation’ has taken a turn for the worse since 2011 with the publication of alarmist intelligence reports and the multiplication of news reports about European citizens flocking to Syria to fight, mostly alongside the Syrian opposition. Almost unnoticeably, the representation of Syria has moved from chaotic images of civil war to a monstrous cradle for a resurgent Al-Qaida, a powerful magnet for confirmed Jihadists and a key location for nurturing new generations of violent individuals. The fear that European citizens travelling to Syria to fight the Assad regime may be influenced by groups linked to Al-Qaida and the spectre of dozens of battle-hardened, experienced extremists returning to their European homes full of anger and resentment and prepared to stage deadly attacks is an anxious thought stuck in our minds. Even though it is difficult to ascertain the number of European citizens who have gone to or are still in Syria since March 2011 – the figures fluctuate between 400 to 2000 - the need for an assessment of the threat posed by these assumed radicalised European fighters heading back home is largely shared across the European Union member states. The recent French anti-radicalisation strategy presented by the French interior Minister Bernard Cazeneuve, in April 2014 and inspired by the British strategy, is a reaction against the growing ranks of French youth joining alleged jihadist groups in Syria. However, what is the logical link - if any - between an engagement in Syria – whatever it might be – and the likelihood of future attacks in Europe? Our report for the European Parliament, Preventing and countering youth radicalisation in the European Union, released in April 2014 offers a rather simple answer. We commonly gauge the dangerousness of these returnees on biased assumptions: going to Syria is very often read only within the framework of an intentional desire for Jihad, and radicalisation is commonly understood as a linear, mechanical and incremental process following the old and not so wise adage, once a thief, always a thief. Unfortunately, these assumptions have contributed to the production of a pervasive narrative about the nature and the level of danger posed by these returnees. As spelt out by the authors of the report, “If a “Jihad Candidate” can be found in the ranks of multiple katibas grouped under the banner of the Free Syrian Army (FSA), integration into a component of Al-Nosra Front does not automatically denote an ideological adherence to their action: in fact, many units are actually more independent and pragmatic than the statements of the leaders of the Front suggest” (p.15). Secondly, the alarmist view of the danger of European citizens coming back from Damascus is aggregating disparate trajectories and activities in Syria (from humanitarian support to combat experience) under the same rather suspicious and certainly nervous agenda. Thirdly, and perhaps more importantly, such views about returnees pay insufficient heed to the fact that, across contemporary time and space - from the Spanish civil war to Bosnia, Mali, and Chechnya via Afghanistan - continuities in commitment after direct involvement in violent conflicts are the exception rather than the norm, and there is no reliable evidence that veterans of conflict move in that direction. Of course, some individuals might continue the struggle they have started to engage with in Mali, Syria or elsewhere, but not necessarily in a violent way. More probably, most of the ‘returnees’ will not continue the struggle. As the report highlights, the term ‘radicalisation’ is an unhelpful concept for understanding the context, contents and mechanisms of recruitment, activism, violence and escalation. People who become involved in violent activities are not suddenly converted to this path and then inherently stuck with a single-minded line of action. This process is gradual and it is an incremental dynamic full of uncertainty about what might be next. The unfortunately commonly shared idea that extremism is nothing but the fatal conclusion of an ineluctable linear process is a crucial misunderstanding of the realities of violence. Worse, these biased and narrow-minded understandings of ‘radicalisation’ have led to poorly conceptualized and somewhat dangerous counter-terrorist policies across the European Union member states. The Syrian tree that hides the forest? When reviewing the numerous counter-terrorist and preventive counter-radicalisation policies in Europe, we cannot point conclusively and entirely to their effectiveness. On the contrary, these counter-terrorist policies – which allow for an extension of judicial and executive powers – and their accompanying policies of prevention show mixed results. Certainly, they raise key issues in terms of fundamental rights, ethnic and racial discrimination and social cohesion. Real and legitimate concerns include the extension of pre-emptive judicial powers across European countries coupled with significant extensions of the pre-charge detention period (the United Kingdom leads in this respect), a disturbing growth in the weighting of intelligence material over evidence in courts, a nearly all-embracing definition of ‘terrorism’ as an offence, a maximisation of the scope of terrorist investigations and of terrorist arrests and wider control of online materials. In addition to prosecutions, most European countries have developed a broad range of administrative measures which have a considerable impact on the lives of many citizens in Europe. Stop and search powers have been regularly denounced. As noted in the report, “These police powers are among the most resented form of police interventions and generate a high level of alienation and feeling of discrimination among targeted communities, with very little policing value” (p.22). If immigration policy has always been inextricably linked to the European security agenda, the current situation in Syria and growing concerns over European citizens fighting alongside Islamist groups, as well as the subsequent fear of seeing ‘radicalised returnees’, have re-focused counter-terrorism and counter-radicalisation efforts on harsher and more discriminatory forms of border control. In the UK, for example, the control of ports and borders is encoded in schedule 7 of the Terrorism Act 2000. This allows, in principle, any police officer, immigration officer or customs officer to stop, question and detain any person, as well as search luggage and vehicles, in order to ascertain whether he or she might be concerned with acts of terrorism, for up to 9 hours. Within the scope of administrative measures used to combat radicalisation, the deportation of foreign nationals in France carried out on the grounds of serious threats to the public order is a rather interesting measure. The assessment of such threats is generally solely based on intelligence services’ memos, with no obligation for them to disclose their sources. As noted in our report, “these powers have a considerable broader impact in terms of the expansion of executive power over judicial procedures” (p.26). Without any doubt and across Europe, police and intelligence services have been given greater power to investigate terrorism alongside an increased surveillance and information-gathering logic. While this particular offensive trend is well established, the 2005 London bombings have contributed to the implementation of preventive or soft counter-terrorist measures – e.g. the PREVENT strand of the counter-terrorist strategy CONTEST in the United Kingdom. These preventive policies include the establishment of partnerships with community representatives, investment in social and neighbourhood projects, as well as mentoring schemes dedicated to youths considered “at risk” of radicalisation. The concern that these measures would only contribute to the stigmatisation of and suspicion against the Muslim community as a community composed entirely of potential terrorists has been widely debated. More recently, it is the partnerships established between community representatives and local counter­terrorist police that have generated questions. To what extent are these partnerships being used as a covert means of gathering intelligence about the structure and relations within the community? As the report notes, “The focus of the most recent PREVENT strategy (2011), as well as the results of the Prime Minister’s Task Force on Tackling Radicalisation and Extremism (2013) further reinforce the fear of “snooping”, with the focus on institutions such as schools, universities or hospitals, where teachers, professors or doctors are encouraged to report potential ‘radicals’” (p.29). Certainly, the question of the adequacy of these programmes altogether and in particular the lack of distinction between social work and local policing is very challenging. While these different measures might not directly contribute to the escalation of violence per se, they have in several instances been found to generate a feeling of suspicion that is unhelpful to the relations between the state and Muslim communities across Europe. As we report, “radicalisation and counter-radicalisation co-exist and shape one another. The EU agenda has been inspired by the context of the war on terror and needs to be profoundly revised considering its perverse effects. 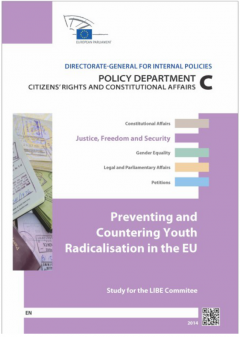 […] widespread counter-radicalisation measures across European Union Member States might become factors for radicalisation, instead of preventing radicalisation” (p.31). European countries have undertaken progressively more stringent counterterrorist measures in the name of national security and the safety of citizens and have attempted to avert the growth of extremist views by implementing preventive and counter-radicalisation policies. As Preventing and countering youth radicalisation in the EU makes clear, European counterterrorist and counter-radicalisation policies not only have the potential to undermine the democratic principles, institutions, and processes they seek to preserve but also to produce unintended consequences; rather than discouraging violence, they may trigger and encourage it. Actually, we may need to be more concerned by trends in European counter-radicalisation policies’, their social and political effects, and their unintended consequences rather than by European citizens heading to Syria who, if they come back, mostly come back disillusioned. The report has been requested by the Committee on Civil Liberties, Justice and Home Affairs (LIBE) of the European Parliament and written by Didier Bigo, Director of the Centre on Conflict, Liberty and Security (CCLS) and Professor at King’s College (United Kingdom), Laurent Bonelli, lecturer at the University of Nanterre Paris X (France) and associate researcher at the CCLS, Emmanuel-Pierre Guittet, Lecturer at the University of Manchester (United Kingdom) and associate researcher at the CCLS, and Francesco Ragazzi, Lecturer at the University of Leiden (The Netherlands) and associate researcher at the CCLS.